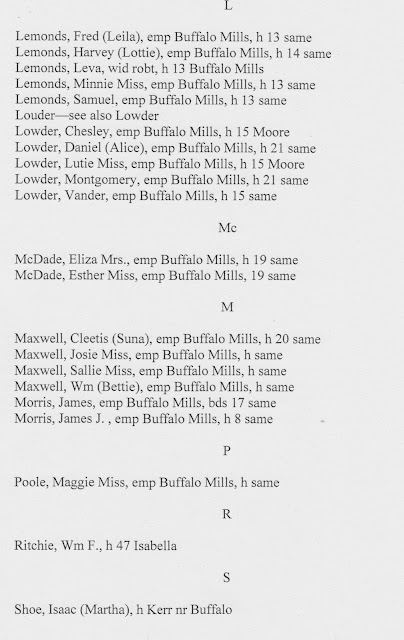 One of the treasures I found on my trip to the Lore Room in the Cabarrus County Library was a book by Timothy W Auten titled "Buffalo Cotton Mill 1908 Employees compiled from the 1908 Concord City Directory". I was flipping through the pages and came across a familiar name: Davis, Wm (Maude) emp Buffalo Mills H 3 same. In reading the preview, I knew that meant House number 3 on the street of the same name, Buffalo, which is now called Buffalo Avenue. Buffalo Avenue is now shorter than it once was, and old homes have been replaced by new ones or businesses, however some of the old housed remain and have been maintained. I few pages later I found this page. 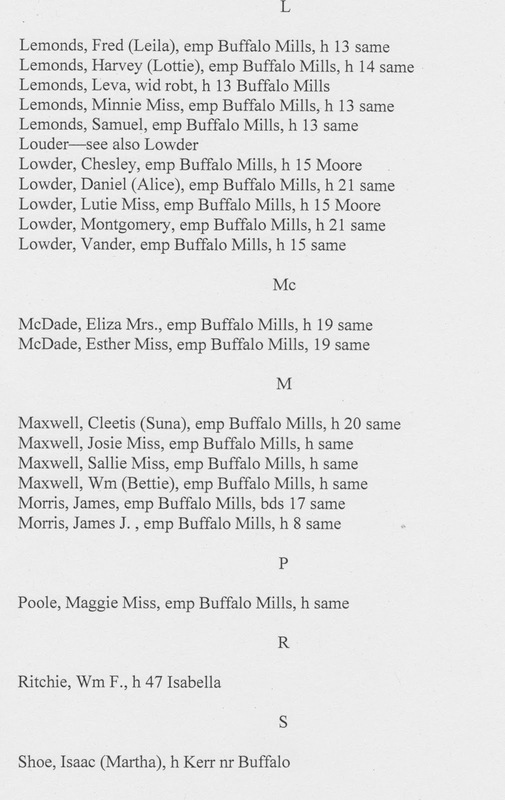 Maude Lemmonds had married a William Davis and was living in House 3, her mother Leavy, widow of Robert, was living in house 13, as was her brother Fred and his wife Loula (spelled Leila in the book), her sister Miss Minnie Lemmonds, and brother Samuel. Brother Harvey and his wife Lottie, my great-grandparents, were living next door in House 14. House on Buffalo Street typical of Mill Village homes. When I left, it was dark, and I did not attempt to drive down Buffalo Ave, but rest assured, my next trip to Concord, I will find out how to get, how to get to Buffalo Street. Two story house on Buffalo Street, probably a Supervisors home. Another house on Buffalo Avenue, once Buffalo Street, Concord, NC.